This is Part III of a III part series. 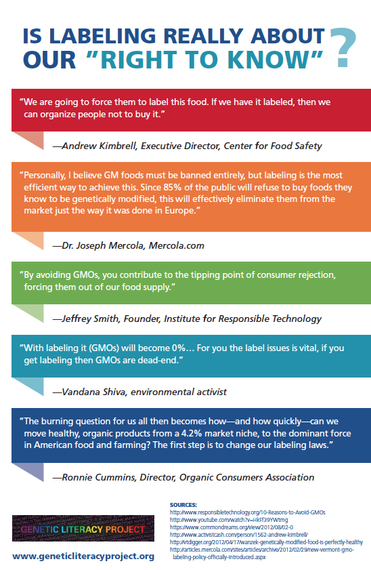 Part I: "Although Some GMO Sympathizers Embrace Mandatory Labeling, It's A Disaster In Waiting", is readable here. Part II" "The Real Cost Of Mandatory GMO Labeling", is readable here. 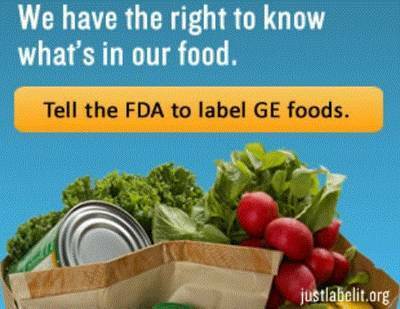 Under U.S. law and regulations, announced in 1992 and reaffirmed in November 2015, labels for foods containing genetically engineered ingredients are required when "there is a material difference -- such as a different nutritional profile -- between the GE product and its non-GE counterpart." Research shows and the Food and Drug Administration affirms that there is no safety or compositional difference between GM foods and their conventional counterparts. But some people believe there is a difference, or have other motives such as a desire to put a halt to genetic engineering or promote other forms of food production such as organic agriculture, and therefore believe labels are appropriate. At the end of the day, even if Congress should pass a labeling law, it would be up to courts to decide if there is a material difference in any particular food to the extent that it trumps a developer's First Amendment rights, which protects it from forced prejudicial speech. State labeling laws have in addition the problem of pre-emption of federal labeling authority so they will be headed to court, as is the case in Vermont. There are other legal arguments against forced labeling. Suffice to say that if the states or federal government pass such laws the courts will ultimately decide their legitimacy. Thus labeling is not about what the people want or what the industry wants, it's about how the courts interpret our constitution and laws. One role of the court system is to temper public passions. Another is to hold those who govern in check. We are in for a long legal battle on labeling. We do not agree with those who predict that there will be an endless flow of state initiatives being voted upon. The Vermont case will tell us a great deal. If the courts find the law unconstitutional it's going to be very hard for other states to mount ballot initiatives. Some industry experts believe that the SCOTUS decision last June in the case of Reed v. the Town of Gilbert sets a precedent that suggests that the courts will find state mandatory labeling laws, such as that passed by Vermont, are unconstitutional. These referenda have been costly for the food industry. And if it is expensive for the industry to keep defending ballot initiatives, it can't be easy for the labeling advocates to keep spending on a losing cause. Based on voter demographics, the most likely states to approve a ballot initiative have already voted no on ballot initiatives so the chances of success get smaller in each successive state in which initiatives appear on the ballot. The second thing that might happen -- although less likely -- is a national law that mandates voluntary labels and affirms FDA's authority. That's being debated in Congress now. That law, if it should pass, would have a chilling effect on state labeling initiatives too. We don't favor such a law because we oppose any law that makes GMOs a distinct legal entity that is different from organisms bred by any other modality of breeding. I've come to the conclusion that "GMO" is a cultural construct. ... As one researcher put it [in Nature], "It is theoretically and practically impossible to precisely specify a supposed common denominator for all these [GMO] products." ... Why does this matter? Because once people understand how mushy the definition of GMOs really is, they start to realize how hard it would be to make substantive change by regulating GMOs. All breeding creates genetic modifications. From a science perspective, we don't like pro-labeling or no-labeling laws because genetic engineering to produce GMOs is just another way of breeding -- all breeding introduces genetic modifications. And it's a moving target. As Johnson affirms, the technology keeps moving so fast -- most recently with the introduction of various forms of gene editing -- that last year's definition of GM won't capture next-year's technology. Labeling would cause chaos in the food industry, raise prices, reward retailers who exploit the consumers gullibility and the anti-science wing of the organic industry with windfall profits and accomplish absolutely no good. Consumers who can't define what a GMO is wouldn't even be told if half the products they eat are GM or not. We are not foolish enough to think that the court declaring mandatory labeling unconstitutional or the passage of a national law against mandatory labeling would stop anti-GM activism. In fact, there is already evidence that activists are now focusing on city and county GM bans and other kinds of local ordinances. It's a kind of asymetric grass roots guerilla warfare to which the food industry will be hard pressed to respond. We don't think anything will cause anti-GMO and food and agricultural activists to 'lay down their arms' until the people who are advocating vast restrictions on GM products succeed and/or find another issue and another source of financial support for their campaigns. Their agenda is to become a political force and a broader mainstream movement. As a society we have to decide if we are going to let small groups of well-financed professional activists drive the public policy agenda on issues like the GMO labeling fight. These groups claim to represent the people but they are self-appointed rather than elected. They accuse those who oppose them of being shills for industry but many of them are in the organic industry (i.e. Gary Hirshberg, founder of Just Label It, is also founder of Stonyfield Organic, which like other organic firms would profit immensely from the misinformation conveyed by a GMO label) or in the full time pay of so-called non-profit corporations, particularly in the organic industry. 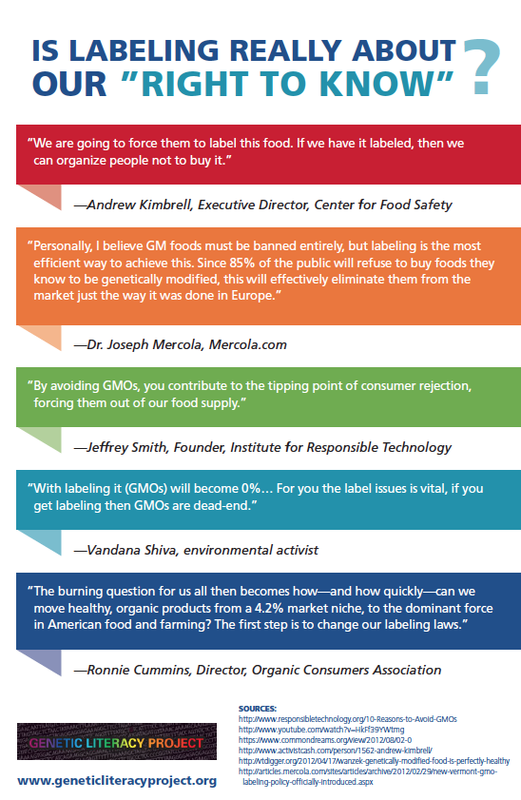 It's already well established that the leading organizations in support of GMO labeling are also committed to discrediting agricultural biotechnology -- as these quotes clearly document. There is no mechanism to hold them accountable for what they say. Absent accountability they use misinformation and fear-mongering to whip up support for their agenda. And who funds them? In many cases groups who stand to profit from their activities. We wonder how the voters who have supported what they have believed were grassroots efforts to bring "right to know" labeling to their state would think if they knew that the statute that passed in Vermont was written by the notorious Emord & Associates, a Washington DC law firm that represents key players in the fringe sectors of the organic, dietary supplement and alternative natural products industry -- including Mike Adams, founder of the quack site NaturalNews.com -- in its drive to prevent labeling of its products. Emord, working with the anti-GMO Center for Food Safety, has been a key advisor to activists drafting anti-GMO labeling initiatives around the United States. Like the Chinese proverb says "may you live in interesting times." We do. Yogi Berra said "predictions are hard, especially about the future." Our prediction is that eventually the future will tell us who was right about whether this is or is not a seminal issue, and we will also learn if we did the right things to ensure that 10 billion people in 2050 can sustainably produce enough food. Neither of us will be here to find out if society made the right choices, but when we think about our children's and grandchildren's future, we are not encouraged that we any longer have the will to resolve our differences and move forward. Labeling being just one example. We have some tough choices to make as a society. Climate change, growing population, and vanishing resources all require us to work together to develop technologies and practices to meet those challenges.